Englewood takes seriously our call to help each person become the person God created him/her to become, building up each one, equipping each one, helping each one grow into the servant God’s grace has been preparing them to become. We believe that Jesus Christ is Lord. We believe that God offers and wants a personal relationship with each of us through prayer, study, worship, witness, and service. We believe in the Holy Spirit; the Counselor, Comforter, power (Rauch: breath of God) giving life to all who believe, and guide. We believe all are part of the body of Christ and each person is needed for us to become all that God wants us to become. We believe that God has a plan and purpose for every one of us, a plan that includes using each of us to share His love with others. We believe that God has been involved in each of our lives even before we knew God was there. We believe that God's grace, shown decisively in Jesus, is sufficient to cover, wash away, and forgive all sin. As United Methodists, we are connected to Christians all over the world who join us in the hope of making disciples of Jesus Christ for the transformation of the world. To learn more about the United Methodist Church, click here. To learn more about what we believe, feel free to contact us or visit us for worship. Church members gather for worship at Overton's BBQ Restaurant. 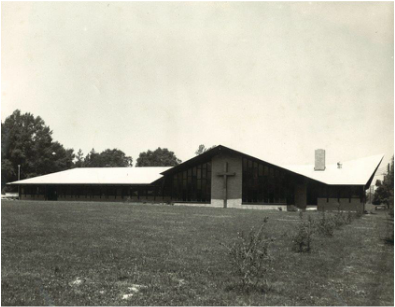 Englewood Methodist Church was founded in 1955 by a group of 154 charter members, who originally gathered in people's homes and later met for worship at Overton's BBQ Restaurant. The church was approved for inclusion into the conference of the Methodist Church, and Rev. Frederick Still of Tennessee was appointed pastor. 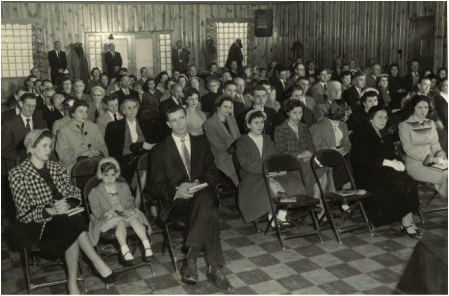 Shortly thereafter the church building was constructed on the lot at the corner of Sunset Avenue and South Circle Drive, where our first service was held in the Fellowship Hall in 1957. The church sanctuary opened in 1964. This church has always been missions and community-minded. Soon after the church was established, the members had already organized chapters of the Women's Society of Christian Service, the Men's Club, and the Methodist Youth Fellowship (now UMYF). 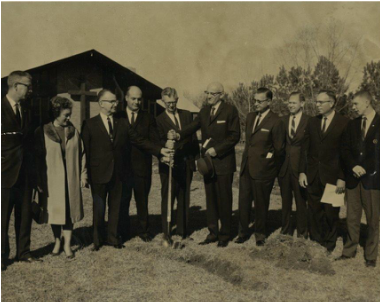 Groundbreaking ceremony for the sanctuary - January 5, 1964. Englewood UMC building before sanctuary addition.